Penn Manor High School’s Quiz Bowl team is headed for national competition after compiling an impressive 15-3 record this season. 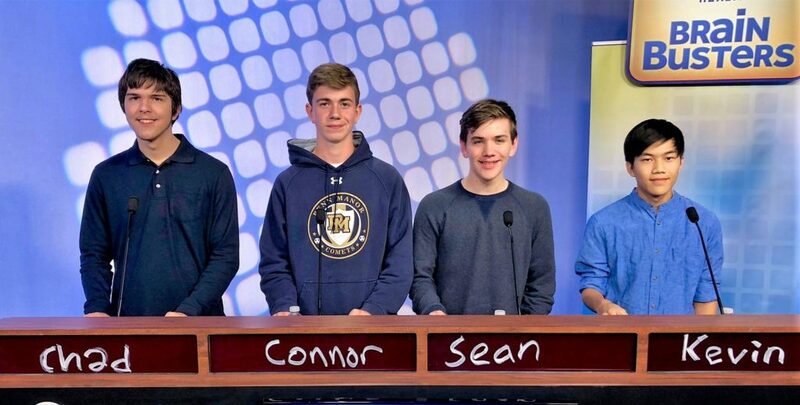 The team of sophomore Connor Mayers, juniors Sean Moore and Chad Hoglund and senior Kevin Ward will compete in the High School Quiz Bowl National Championship Tournament May 26-29 in Atlanta. But before they head south, the students will participate in a tune-up match on Monday, May 21, against a team of Penn Manor faculty, beginning at 3 p.m. in the high school library. The teachers will include Anthony Carrodo (math), Chris Meier (economics), Brian Reinking (English), Katherine Rodriguez (Spanish) and Matt Scheuing (history). Penn Manor qualified for the national tournament by placing in the top 15 percent in regional tournaments throughout the year and by finishing third in the Lancaster-Lebanon League playoffs, said Meier, who serves as Quiz Bowl advisor with Sallie Bookman. Throughout the year, more than 20 Penn Manor students, including many freshmen and sophomores, participated in Quiz Bowl, Meier said, which bodes well for future Penn Manor teams. Connor Mayers, the team captain, said he’s looking forward to the national competition. “In many ways we’ve outdone the expectations I had for this season, and I’m excited to see how we do at nationals,” he said. And how does Connor feel the students will fare against their teachers? Congrats to the students and staff on this impressive accomplishment! From left, Quiz Bowl team members Chad Hoglund, Connor Mayers, Sean Moore and Kevin Ward.